The Bemis Center for Contemporary Arts and Qwest Center Omaha are proud to announce the official debut of Omaha’s Cultural Quilt on Saturday, July 9th, at 12:00 noon, at Qwest Center Omaha. All of Omaha is invited to the grand Unveiling Ceremony that will introduce the Cultural Quilt to the entire city. This event is free, and the public is warmly invited to attend and be a part of the celebration. 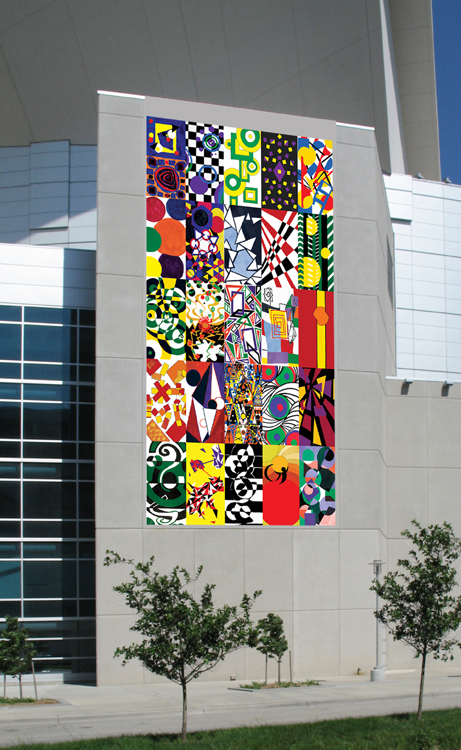 The Bemis Center for Contemporary Arts created the Art 4 Omaha initiative to raise public arts awareness by collaborating with community members in the creation of spectacular artwork for display in prominent locations. By directly involving the community with creating public art, the Art 4 Omaha projects have significant civic impact, both culturally and educationally. With this in mind, the Bemis Center specifically designed the Cultural Quilt project in partnership with Qwest Center Omaha, to involve young artists directly with the creation of public art. Twenty-five high school and community groups from around Omaha collaborated to create the artwork featured on the 30-foot-wide by 60-foot-tall banner installed just south of the 10th Street Arena Entrance at Qwest Center Omaha. Omaha’s Cultural Quilt welcomes visitors into downtown Omaha and celebrates our city’s rich diversity and cultural heritage with vibrant images and colorful symbols. Just as Qwest Center Omaha serves as one of our community’s main gathering places, it’s fitting that the city’s youth has gathered together to create this powerful, united symbol. Come and join Qwest Center Omaha and the Bemis Center for Contemporary Arts at Qwest Center Omaha on Saturday, July 9th, and see how Omaha’s Cultural Quilt unfolds.